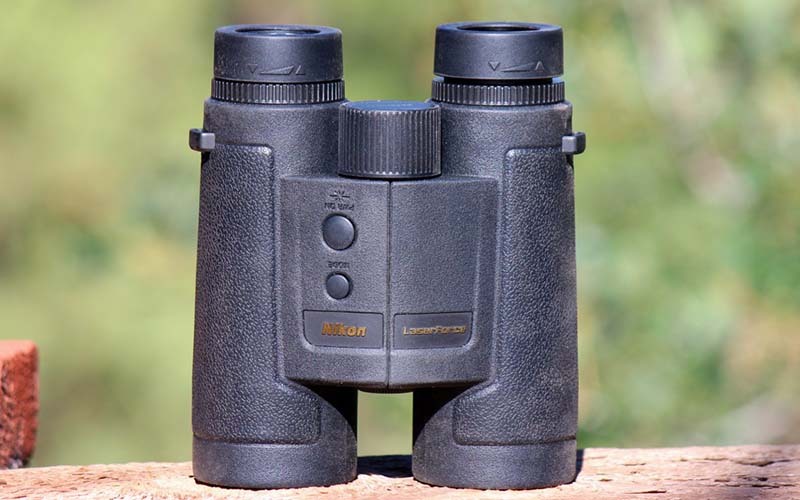 The new Nikon LaserForce is a top-notch hunting binocular, and the performance of its integrated laser rangefinder is strong! 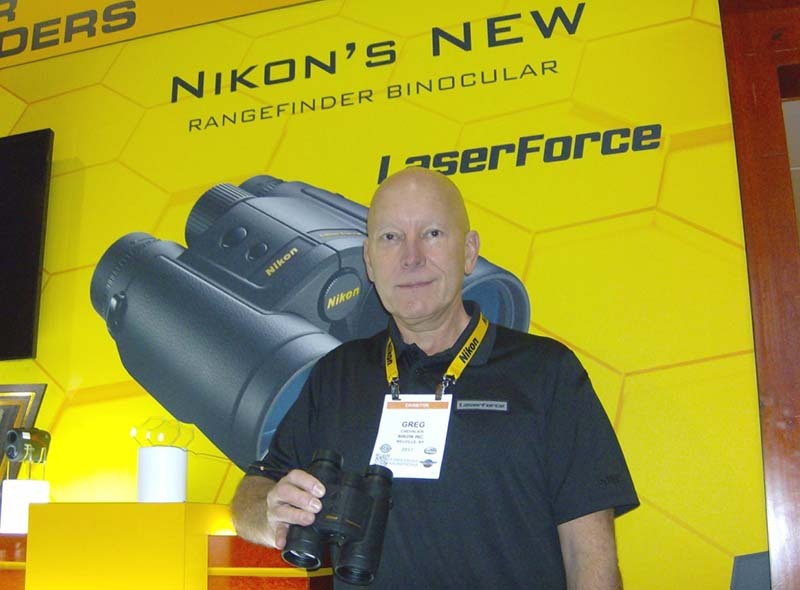 My “first look” at the Nikon LaserForce Rangefinder Binocular came at the 2017 SHOT Show, reported back in January in my article Best Of SHOT 2017 – Hunting Part 1. There was just one unit to share with 65,000 show attendees, but thanks to Greg Chevalier, President of Chevalier Advertising, I was able to spend some quality time with each of the latest Nikon offerings. Despite convention center viewing limitations, the LaserForce was impressive. As the advertising agency for Nikon Sport Optics, Greg’s company was promoting the LaserForce as: “The single optic solution for serious hunters who depend on both their binocular for picking out distant animals and their rangefinder for getting the exact distance before taking the shot.” As a “serious” western big game hunter, I mentioned to Greg that I would like to field test the LaserForce when production models were available. 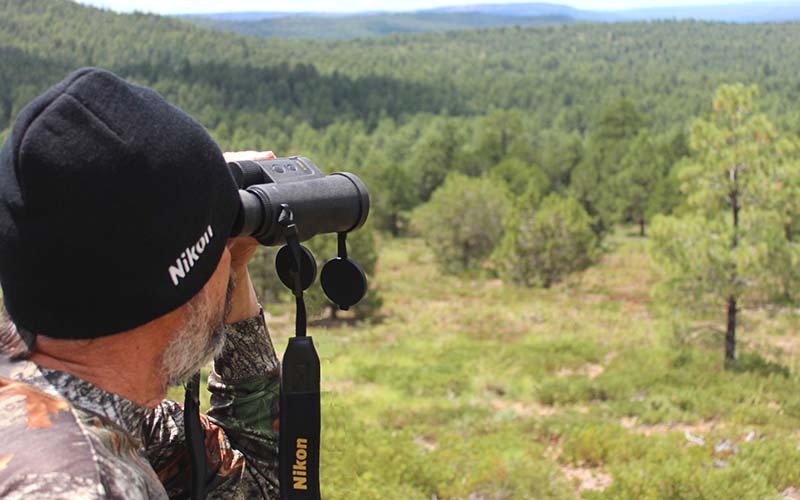 Christmas came early – around the end of July – when Nikon’s long awaited entry in the rangefinding binocular market arrived for testing. Game on! Greg Chevalier demonstrates Nikon’s new LaserForce at SHOT Show. The LaserForce has been my constant companion for the past two weeks. 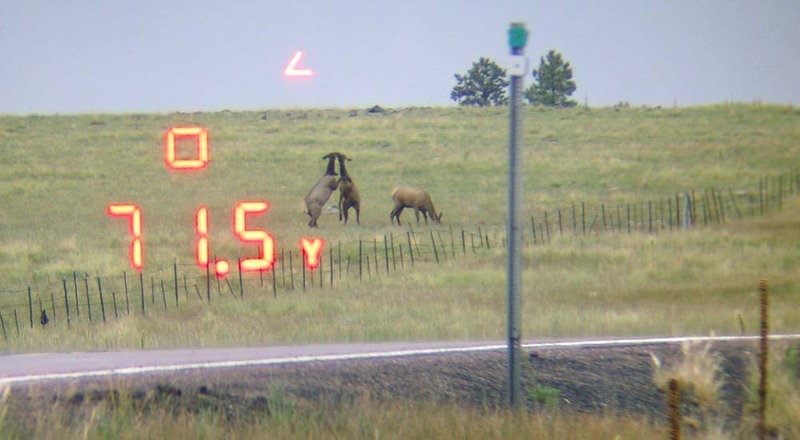 Opportunity for testing has been good while scouting for elk and mule deer in Arizona’s White Mountains, in a variety of weather conditions – from dry and warm to high-powered monsoon rain and icy-cold hail storms. My assessment so far: This is a truly remarkable hunting optic, especially when price is taken into consideration (MSRP = $1199.95). With a powerful, full-featured laser rangefinder married to an excellent quality binocular in a well designed and comparatively lightweight case, LaserForce performance on both fronts is on par with comparable units costing 2-3 times more! 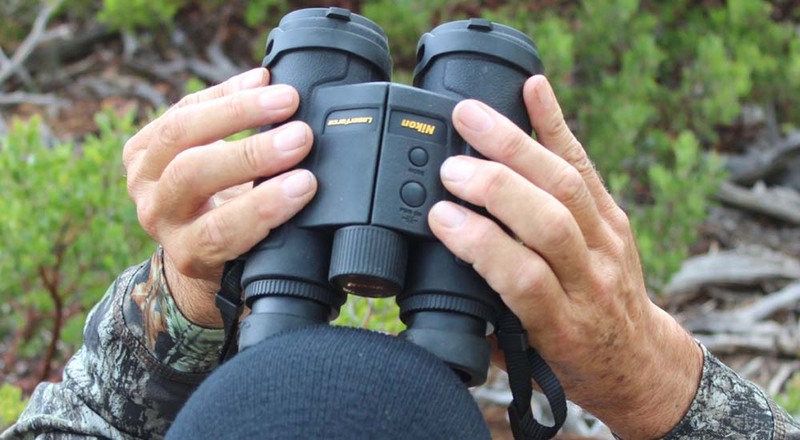 A combination binocular-rangefinder offers some obvious advantages, and some not so obvious. One piece of gear instead of two to keep ready for use… obvious. With so many straps and cords hanging around their necks, some over-geared hunters today resemble marionettes! Fewer straps to become entangled, particularly when bowhunting… pretty obvious. Ever find yourself fishing around for that rangefinder when a quick distance estimate is needed? Most hunters keep their binocular readily available, usually with neck strap or shoulder harness. 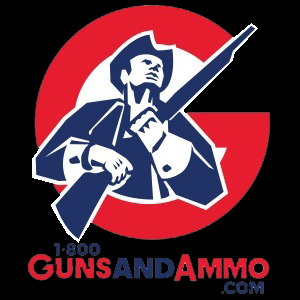 If the rangefinder is housed in the bino… voila! How about spotting an animal moving through cover, and then ranging it accurately without having to take your eyes off the potential target? This one may not be obvious, but it can provide a distinct advantage. And, one-handed viewing/ranging with a compact unit like the LaserForce leaves one hand free for holding the rifle or bow… pretty handy. There is one notable disadvantage, however: If your binocular-rangefinder combo unit is lost, stolen or damaged, you lose both functions that have become hunting essentials. How far will it range? This is the most common inquiry, and Nikon advertises 1900 yards on highly reflective, flat surfaces and 1100 yards on deer-sized animals. I have personally confirmed these claims, with measurements of rocky outcroppings and bluffs as well as large tree trunks near the maximum, and animals like elk and bighorn sheep over 1000 yards (see data table below). The ranging function is also well suited for bow hunters. Unlike other rangefinder-binocular combos, the LaserForce will measure distances as close as 10 yards, with verified accuracy to one-tenth of a yard. Hunters will appreciate the 10x magnification, generous target reticle, and almost instantaneous measurements regardless of the distance. Readings are given in 0.1 yard increments to 100 yards, and 1-yard increments past 100 yards. The OLED display is sharp and 4 different brightness levels are selectable with the mode button. This is a nice feature for all day use, as light intensity varies from dawn to midday to dusk. It also facilitates easy reading against various landscapes from light to dark, and backgrounds from solid to broken. Control buttons are well placed on the top of the unit, with the mode button just in front of the slightly larger on-off/ranging button. This unit also features Nikon’s ID (Incline/Decline) Technology that compensates for uphill or downhill shooting angles. The mode button is used to toggle between the true horizontal distance (ID on) and the longer actual or angled distance (ID off). I’ve found this function to be precise for distances out to 35 yards, by ranging a spot near the top of a 100-foot pine tree, then measuring the true horizontal distance to the trunk on the ground. The mode button can also be used to toggle between yards (y) and meters (m). One negative: Although buttons are well placed, they are not raised/recessed enough from the top surface, making them difficult to feel with bare fingers, and impossible to locate with gloved fingers. When a subject for ranging is spotted after viewing for an extended period, I’ve often had to drop the optic and look at the top to place a finger on the ranging button, then look back through the optic to re-acquire the target. LaserForce rangefinder display showing distance to target in yards (y) with square target reticle above, angle compensation (<) turned on, and OLED brightness set at highest of 4 levels for midday viewing. This photo caught two cow elk sparring – sometimes you get lucky! Possibly the best feature is the continuous ranging or “scan” function. Hold the button down and distance is continuously measured and the display refreshed for up to 8 seconds. This is particularly useful for moving targets, and for ranging small targets that are more difficult to hit at longer distances. For example, ranging a bull elk feeding just outside the treeline at 1042 yards, I got the following sequential readings: 1077, 1042, 1080, 1042 and 1041 yards. Thus, the bull was about 1042 yards away, and 35 to 38 yards out from the trees. My slight hand movement while continuously ranging measured the following: tree, bull, tree, bull and bull, respectively. I also ranged Canada geese in a flock, flying toward me and then angling away on approach, using the continuous function from 307 to 54 yards. There is no data available regarding how continuous ranging affects battery life, but the single CR2 lithium battery is rated for 4000 activations. A shut-off function activates automatically after 8 seconds of non-use, preserving battery life. Following are distances measured for animals and objects listed, using individual depressions of the ranging button. Some measurements required multiple attempts as listed. No attempt was made to assess maximum distance capability for any target. The binocular component of the 10x42mm optic features Nikon’s ED (Extra-low Dispersion) glass, same as found in the highly touted Monarch 7 Binocular line. This exceptional glass corrects chromatic aberration that causes color fringing, producing high-resolution, contrast-rich images. Full multilayer-coated lenses and prisms, and a reflective mirror coating that is applied on the mirror surface, ensure a bright image display. The glass used for all lenses and prisms in this roof prism binocular is lead-free and arsenic free as well. Other features include long eye relief (15.5mm) with turn-and-slide, multi-click rubber eyecups that facilitate a good fit. 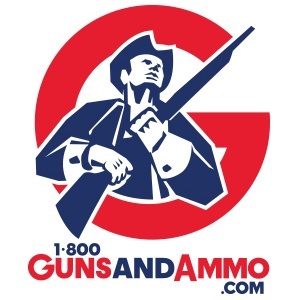 This adds user comfort while ensuring a clear field-of-view (320 ft. @ 1000 yds. ), even for eyeglass wearers. Nikon engineers designed LaserForce to meet the needs of hunters and shooters who “travel the world’s most rugged terrain” – and I will be testing their objective soon, on a hunt in the Tian Shan Mountains in Kyrgyzstan in October. The metal die-cast body is covered with rubber armor that provides an extremely durable exterior, tailored to fit the shape of the human hand. This makes the optic easy to hold steady – which I noted during my initial encounter at SHOT – and facilitates distant image viewing as well as target ranging. The unit is also waterproof and fogproof, thanks to a nitrogen-purged body that prevents fogging and/or molding inside the optical system, even when subjected to significant changes in temperature. Another nice feature are the two diopter rings – one for the binocular (left barrel) and one for the OLED rangefinder display (right barrel). One negative: The case felt tacky coming out of the box, and it collected dust, dirt and hair excessively during initial use in the field. This condition improved after about a week of use. The rubber coating seems to have lost some of its tackiness and firmed up a bit, possibly due to interaction with natural oils from the skin during handling. Rubber armor coating on LaserForce was a magnet for dust and dirt during initial field testing. Tackiness and adhesion of debris has diminished with use. 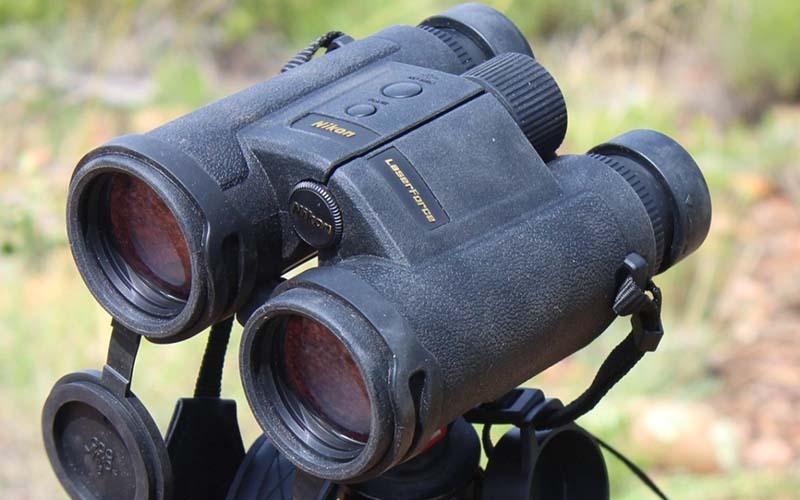 My initial evaluation of the LaserForce binocular function was done by mounting the unit on a tripod alongside my Swarovski 10×42 EL – long recognized as a top-of-the-line premium binocular. To my surprise, the LaserForce (with rangefinder) compares very favorably to the Swarovski EL (without rangefinder), at less than half the price! Known for bright imaging, the Swarovski was a tick brighter in both daylight and at the edge of darkness. The LaserForce imaging showed better contrast, however. This was evident when viewing an acorn woodpecker in spruce tree from 76 yards, 40 minutes after sunset. Contrast between the white breast, white “clown face” and mostly black body of the 8-inch bird was sharper as viewed through the Nikon glass than the Swarovski. Clarity at the edges of the viewing field is better in the EL, as there is slight shading at the edges in the LaserForce. 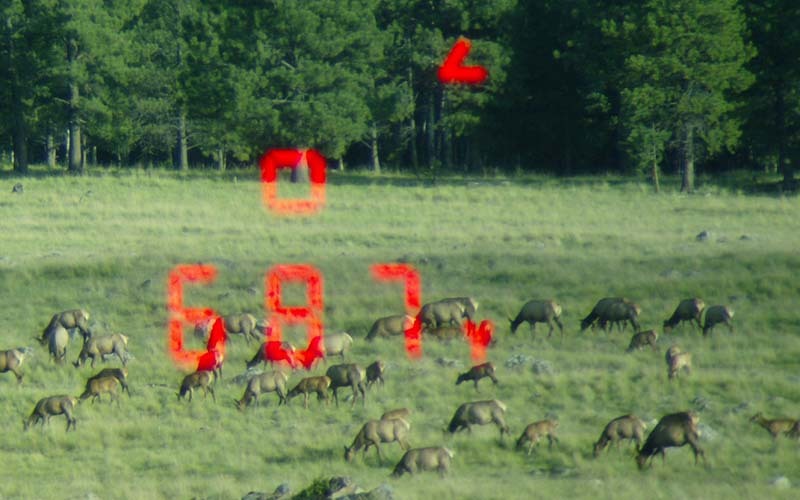 The Swarovski field-of-view at 1000 yards is also 5% larger (336 ft. vs. 320 ft.) but all considered, the LaserForce binocular function is excellent. 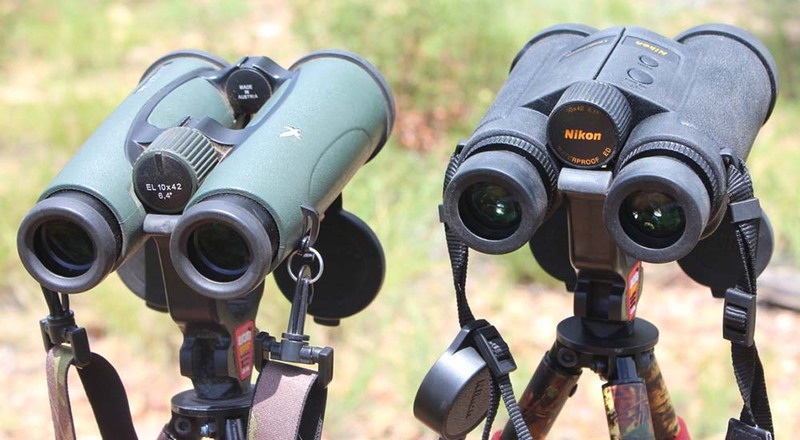 Side-by-side comparison – Swarovski EL binocular (left) and Nikon LaserForce (right). A couple of words about weight – “hogwash” and “baloney” are two that immediately come to mind. It’s been said in print that the LaserForce is heavy, even excessively so. But at 30.9 ounces, it’s actually the lightest of the top eight 10-power rangefinding binoculars! The Bushnell Fusion 1 Mile (31.0 oz. ), new Vortex Fury HD (31.8 oz.) and Swarovski EL Range (32.0 oz.) are all close, followed by Leica Geovid HD (33.5 oz. ), Leica Geovid HD-B (34.7 oz. ), Zeiss Victory RF (35.0 oz.) and Steiner M1050 LRF (44.8 oz.). Consider that most vertical laser rangefinders weigh 8-10 oz. Furthermore, my Swarovski EL bino (with weight-saving magnesium alloy body, but without rangefinder) at 29.6 oz. weighs only 1.6 oz. less than the LaserForce. Thus, weight is a non-issue in my opinion. More importantly, the LaserForce is covered by Nikon’s No Fault repair/replacement policy – both the binocular and rangefinder components. This is a great perk, as most companies exclude electronics from lifetime warranties.